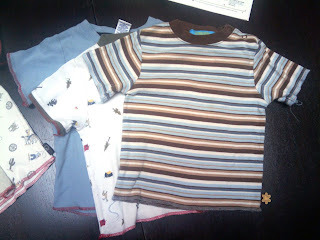 Aldous is in dire need of clothes, so I dug around in the hand-me-down box and fished out a handful of size 3T Gymboree onesies. 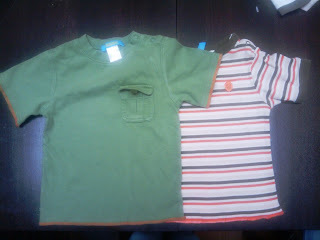 Aldous just wears a 2T and I seem to be fresh out of those! And, William wears a 4, so thankfully, these were available. 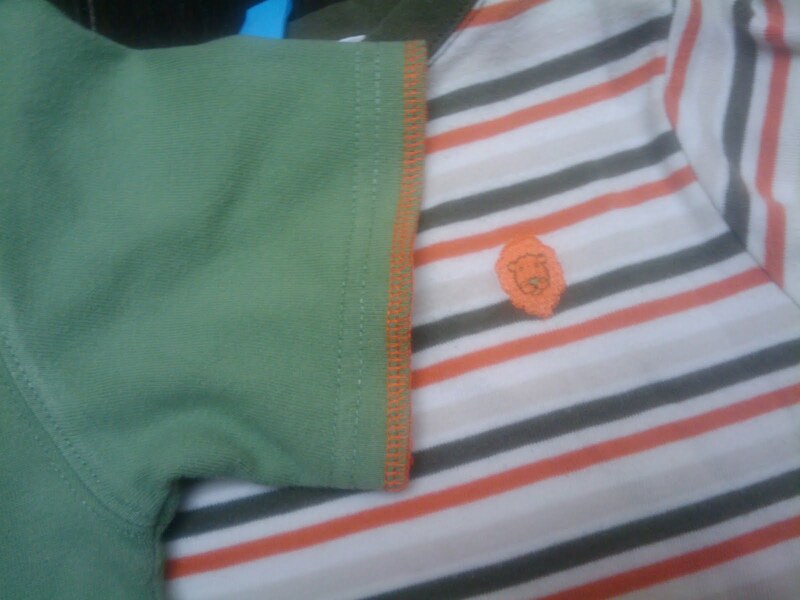 Because Aldous only wears a 2T (and just barely at that) he wouldn't be able to wear these as onesies. He's also not cooperative enough during dressing to fasten a onseie. Here are the before pics...I'm not sure why I don't have before pics of ALL the shirts, but whatever...I've got to get a camera!! I used scissors to cut straight across the hip, right above the binding. Then I used contrasting thread and serged the hem and the sleeve edges. 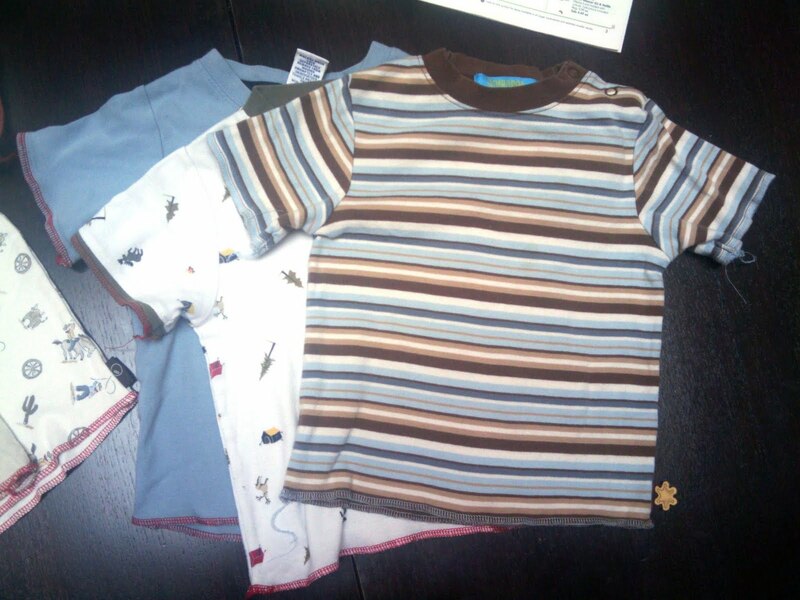 Here's a blue, a camping print, and blue/brown stripe. And the white pineapple, a tan, and an old-fashioned-looking cowboy print. 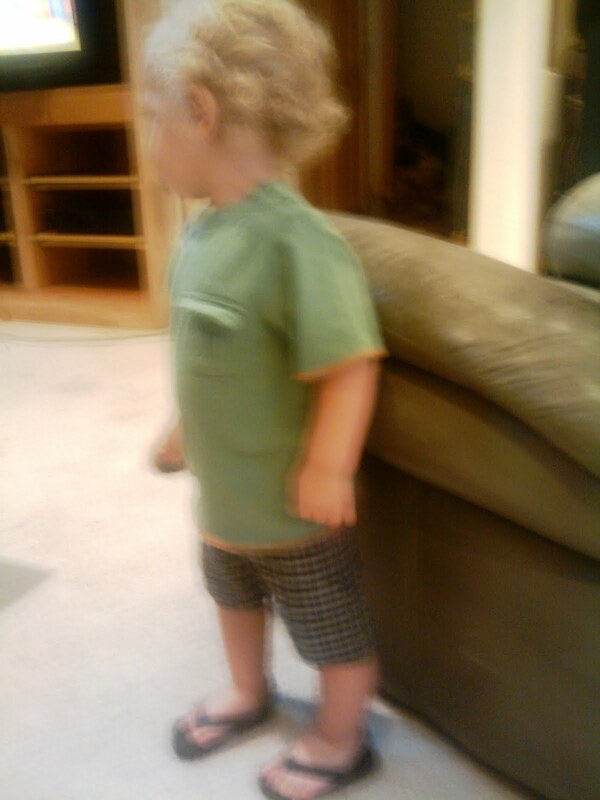 And here is my non-stop model.....always blurry!! But, look how great this length is!! I love these shirts! They're working out so well and look pretty cute with a lot of his simple pull-on shorts. 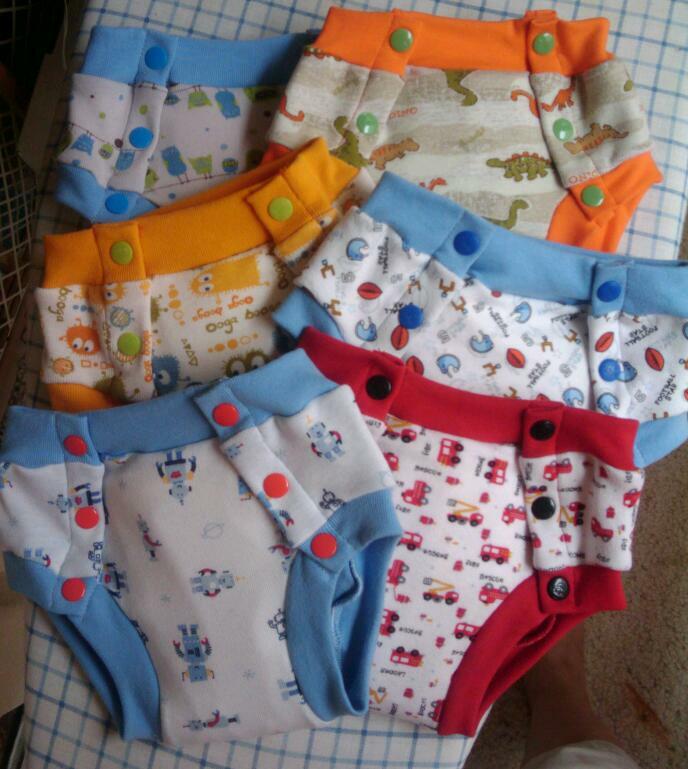 I've also made a ton of training pants just lately. 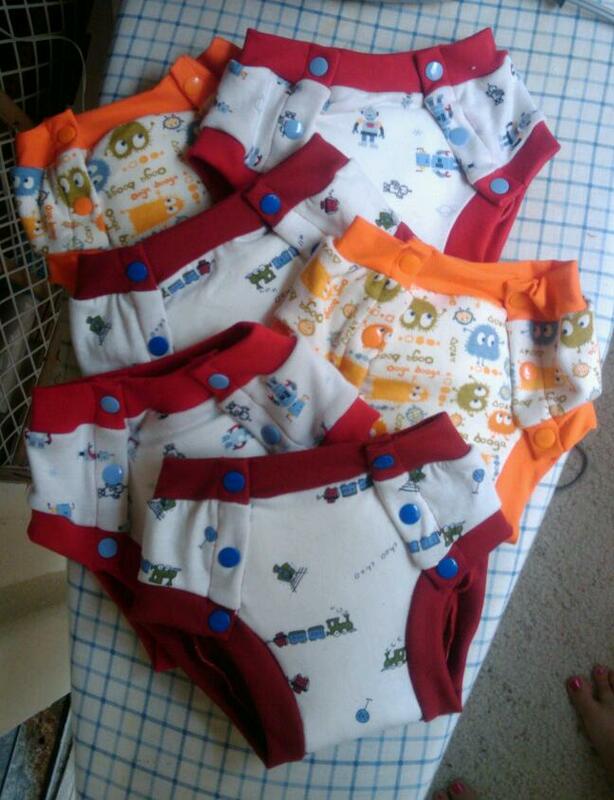 Here are some owls on a line, dinosaurs, ooga booga, football, robots, and firetrucks! a couple girly ones, tho it might be some time before we see any of these modeled! More ooga booga! I love these! I tried out some of my fabric.com monkey fabric, some of the last of my color wiener dog, and my orange and blue Jo Ann puppies print. Speaking of potty training, William is doing better every day! Today he peed twice on a strange potty, and only had one pee accident. Thanks to these trainers, I didn't even know he HAD a pee accident until took him to the bathroom to go! His shorts were BARELY damp! Hopefully, he'll be ready for preK in the spring! 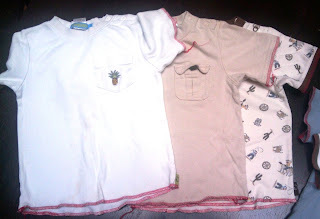 And, while I had white thread in the serger, I sewed up this pair of beach shorts for Audrey. I had cut them out during stash game in February, but hadn't sewn them together. I don't know why, as they took a total of 15 minutes. 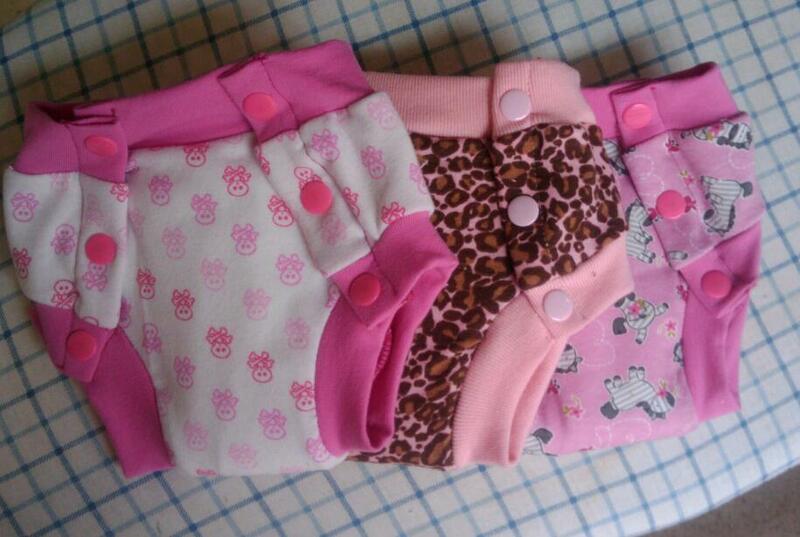 They ARE a bit wrinkled from being in my UFO pile, but hopefully Audrey will find them comfy and useful. 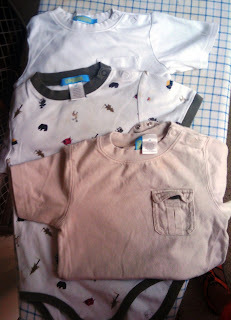 I love upcycyling hand-me-downs. Yours turned out great. Which pattern did you use for the trainers? I really like how they look!